Film Noire has to be one of my favourite styles of photography. I could quite happily shoot it all day, I love it that much. When I heard that Nic Marchant was holding a tutorial and workshop at his Blackbarn Studio in Duxford with Ifa Brand as the model I jumped at the chance to go. I’ve shot that style several times already, but it’s always good to see how different photographers light the set, and with Nic’s background in theatre I knew his way would be different. It wasn’t disappointed, his lighting setup was superb as was his explanation behind the technique. It’s not just about the lighting. There has to be a hook to the picture to generate interest, a little story going on. The term film noire was originally applied by a group of French film critics about American thriller and detective films of the period 1944-54 which were pessimistic, fatalistic and contained menace. So, based on the French films that I’ve seen, the French should know all about film noire. Their industry must have been producing nothing but film noire at one time, just as ours was centred on Ealing comedies. 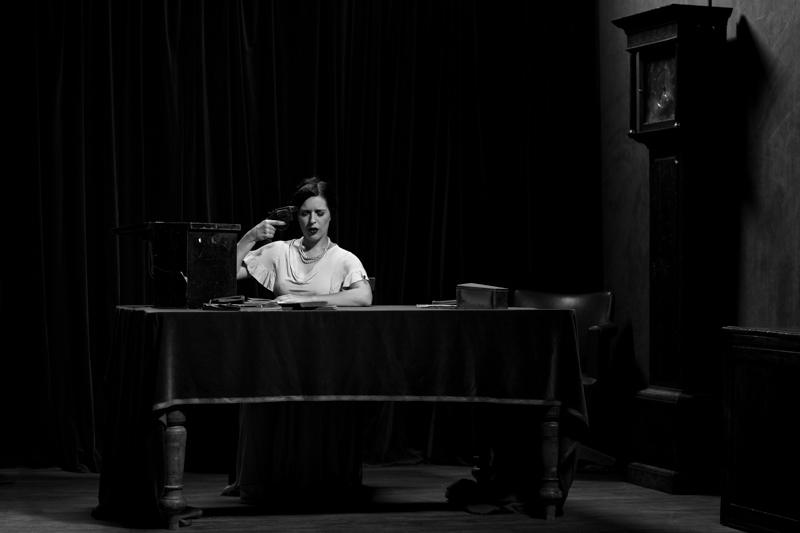 The first shot tries to recreate the correct atmosphere, with Ifa Brand reading a set of depressing books, gun in hand. The second shot is slightly less threatening as there is no weapon to be seen. I hope that the lack of a physical weapon has been replaced by an increased level of menace, as a scantily clad Ifa confronts and taunts her male partner, aided and abetted by few drinks. Getting the balance of lighting and refining it in editing was key to this shot, I hope I’ve got it right.